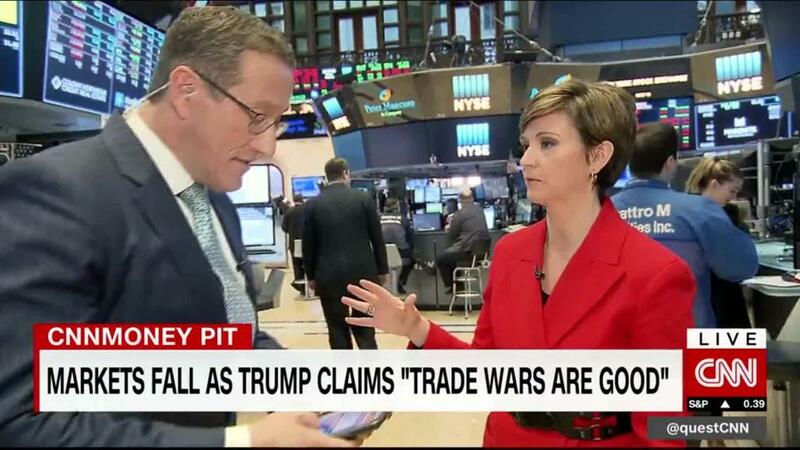 President Trump's proposed tariffs on steel and aluminum has sent shock waves around the world, but they've lit a fire under small stocks. The Russell 2000, the top index for companies that have market values much lower than the giants of the Dow and S&P 500, is up 2% so far in March. And it's jumped nearly 4% in just the past five days alone. Meanwhile, the Dow, home to giant U.S. multinational firms like Caterpillar (CAT), Boeing (BA), McDonald's (MCD) and Coca-Cola (KO), has fallen 3% so far in March. The recent small cap rally has even pushed the Russell 2000 slightly ahead of the S&P 500 for the year. Investors are betting that a more protectionist stance by Trump -- and possible retaliatory tariffs from America's trading partners -- may hurt conglomerates but boost smaller companies with a more domestic focus. Consider this: Shares of Caterpillar, which generated nearly 60% of its overall sales outside of the US in 2017 and has a market value of $90 billion, are down more than 6% this month. But shares of H&E Equipment Services (HEES), a Baton Rouge-based company that rents construction equipment and generated nearly all of its revenue from the US last year, has surged 9% in March. "It's obviously the tariffs," said Ryan Detrick, senior market strategist with LPL Financial, to explain why smaller companies are doing so well in the past few days. "This could just be the start of them outperforming the broader market." Detrick said there are other reasons investors favor smaller companies. For example, they should benefit more from tax reform since many smaller companies have historically paid higher corporate tax rates than larger firms. Kurt Spieler, CIO of wealth management for First National Bank of Omaha, said the solid economic growth in the United States is also good news for smaller companies. Small firms should be able to report better profits than larger companies -- and that should justify higher stock prices. "The higher percentage of revenue from the US is leading to faster earnings growth for small caps," Spieler said. "The outlook for them is less about the benefits of not being part of a trade war than it is liking the fundamentals." Spieler said he particularly likes smaller tech, financial and industrial companies because they should benefit the most from a continued economic expansion. Dave Harden, CIO and president of Summit Global Investments, also thinks smaller companies look attractive thanks to their growth expectations. But he cautions that not even smaller domestic-focused companies will be immune to more volatility in Washington. "I like small cap companies. I really do. There are some great names out there," Harden said. "But the biggest risk I see for the market today is the White House. Whether it's good or bad, it all comes down to Washington."